The Pahrump Valley High School boys basketball team won its first Sunset League game of the season Monday night, pinning a 54-50 defeat on Western in overtime in Pahrump. 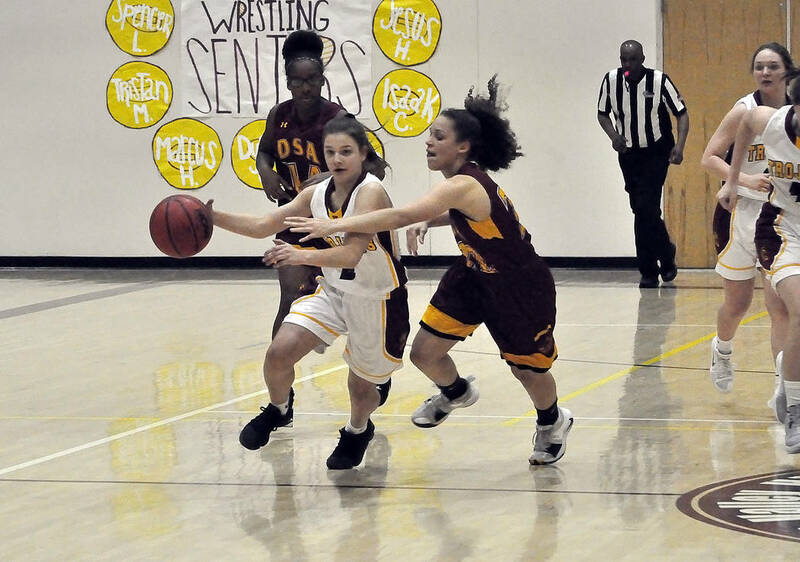 Horace Langford Jr./Pahrump Valley Times Freshman guard Tayla Wombaker, shown against Del Sol, led the Trojans with 13 points Thursday night in a surprising loss to Democracy Prep. Horace Langford Jr./Pahrump Valley Times Senior forward Chance Farnsworth, here at the opening tip against Del Sol, scored 27 points in two games for Pahrump Valley in the past week. Senior Brayden Severt scored 22 points for the Trojans (6-18, 1-8) in a tight struggle that was tied 23-23 at halftime. Senior Chance Farnsworth added 16 points for the Trojans, who trailed 32-30 entering the fourth quarter. The game was dramatically different from the first meeting between the two teams, when the Warriors (6-18, 3-6) routed the Trojans 57-25 on Jan. 16 in Las Vegas. In that contest, Gawain Powell scored 20 points for Western, but the Trojans held him to 13 on Monday night. Meanwhile, the Pahrump Valley girls bounced back from their first league loss of the season with a 35-21 victory over Western. Sophomore Kate Daffer outscored the Warriors by herself, netting 22 points for the Trojans (19-12, 8-1 Sunset League), who held the visitors to just 2 points in each of the first two quarters to lead 21-4 at halftime. Western made a game of it in the third, outscoring Pahrump Valley 13-4, but the Trojans clamped down again in the fourth, holding the Warriors (3-15, 2-7) to 4 points to seal the victory. Samantha Runnion scored 6 points for the Trojans, who had only four players in the scoring column against a Western team they had defeated 46-31 in their first meeting. On Thursday, Sharmayne Finley finished with 28 points, 12 rebounds and 6 assists as host Democracy Prep (9-7, 5-3) stunned Pahrump Valley’s girls 52-46. Freshman Tayla Wombaker scored 13 points, and Daffer had 12 points for the Trojans, who lost their first Sunset League game of the season. It was a shocking result for the Trojans, who had defeated the Blue Knights 66-21 on Jan. 14 as 10 players scored, led by Daffer’s 17 points and 14 from Runnion. In the boys game, Chancellor Johnson scored 34 points and teammate Najeeb Muhammad had 23 points, as the Blue Knights (21-5, 9-0) raced to a 97-44 win over the Trojans. Justous Harvey had 16 points, and Daniel Plumer added 13 points for Democracy Prep, which knocked down 18 3-pointers. 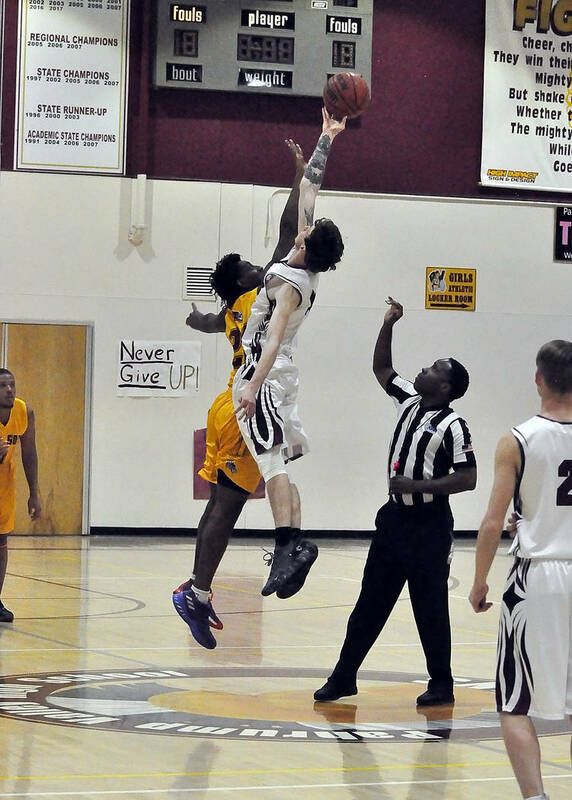 Severt led Pahrump Valley with 16 points, and Farnsworth supplied 11 points for the Trojans.